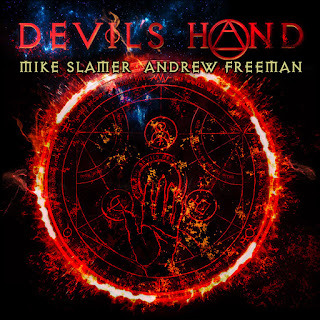 Devil’s Hand is a new project featuring the talents of two outstanding musicians: famed producer/guitarist/songwriter Mike Slamer and the equally amazing singer Andrew Freeman of Last In Line. Mike Slamer has been the guy behind some of the most amazing melodic hard rock releases of the past 20 years (make that 40-odd taking City Boy into it). The list includes, but is not limited to, Steelhouse Lane, Seventh Key, Slamer, and Terry Brock, and we can’t forget his work in the 80’s with Streets (featuring Kansas singer Steve Walsh) and the 70’s with City Boy. The quality of his songwriting and production work is unsurpassed in the business and the records he produced and was involved in stand the test of time! Slamer is probably one of the best musicians you’ve never heard of, unless you’re a fan of the aforementioned bands. He should be a household name! Andrew Freeman is one of the most gifted singers of the current hard rock scene. With his performance on the Last In Line debut album he turned heads not only with his vocal performance, but specifically because he put his own stamp on a band that was incorrectly thought to be “just another Dio tribute act”. From the opening few bars of ‘We Come Alive’, the combined guitar and keyboard riff settle you as a listener into Slamer’s familiar slippers – its crisp, clean, and polished to good effect. The union is cemented just in hearing this first song. Freeman adds as much with his vocals as does Slamers guitar work. ‘Falling In’ is a nice and melodic positive rocker, whereas the acoustic opening of ‘One More Time’ that builds to a mid paced rocker has a stand out chorus. If I’m totally honest, 4 songs in and the bar is set to ‘decent’ without a stand out track so far, but its and album that’s very consistent, and not mediocre. I must admit I have warmed to Freeman’s vocals after a couple of listens, as I didn’t really buy into the Last In Line album, but he is making want to revisit it. Whilst I wouldn’t put it up there with Steelhouse Lane, or Streets, any album that involves Mike Slamer is worth a listen. Its great to see (hear) him back again. This is where Frontiers do a great job, moulding partnerships and putting the money up to get guys back in front of a wanting audience. Long may it continue.